Philippines is now in mourning. Former Philippine President Corazon Aquino died of cardio-respiratory-arrest at 3:18 this morning. She was the first female president of the Philippines, a world-renowned advocate of democracy, peace, women's empowerment and religious piety. Hb has a friend who is closely related to the late President. Although hb did not have the opportunity to meet her personally, he received a Christmas gift from her. For us, this gift will serve as a token of remembrance. A gift that will always be treasured forever. "To Sifu _ _ _, All the best! Cory Aquino"
Our deepest sympathies and condolences to the Aquino Family and loved ones. Farewell to tita Cory (as most Filipinos fondly called her)! She will always be remembered for being a great great woman. May she rest in peace. 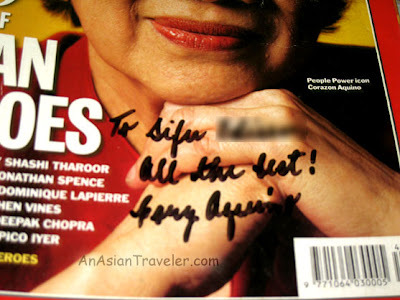 Although I'm not a Filipinos and still a kid when she is in power but I do read many great stories about tita Cory. By being the first female president of Asia, unite her people despite losing her husband to assassination, bring the country back to the path of democracy through peaceful way and battling bravely against the torturous colon cancer are great courageous acts and inspiration to mankind. May her soul rest in peace and bless by God. Your hubby is lucky to have received a gift from Pres. Cory herself! That painting turned puzzle would now be very valuable.